Your Studio Apartment comes with King Bed or Twin Beds, Galley Kitchen, Private Bathroom, Front Patio furnished with Lounge area and Dining Table, and Rear Patio with Day Bed and Comfy Chairs. You will be next to the pool surrounded by lush grounds and only 50 meters to a safe swimming Beach and less than 1 km to Tangalle town. Wifi, 2 bicycles, 7 day cleaning and linen change included. 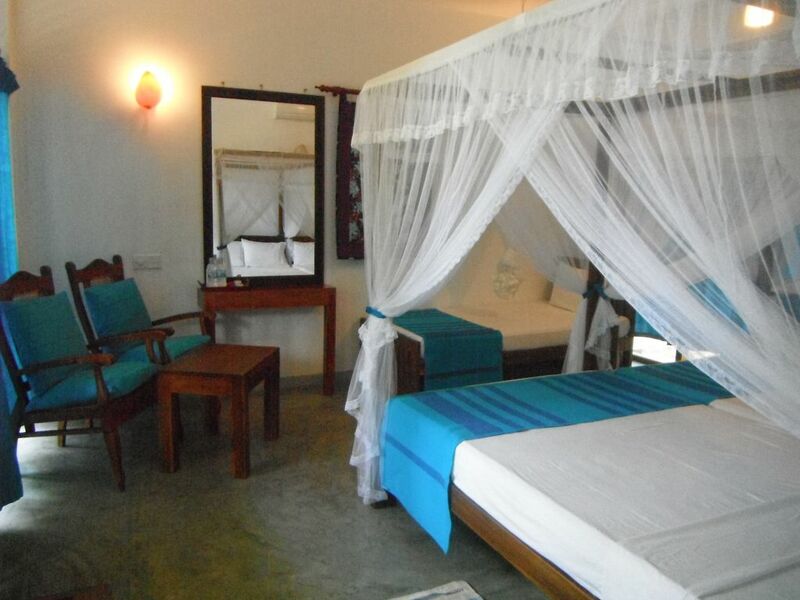 Rates for 2 adults but can accommodate 3 at with third single bed at additional charge. We can arrange tours, transport, guiding to match your interests. Owner is a painter and welcomes other painters to share outdoor patio space suitable for painting. Painting instruction is available upon request for a fee. We have a full service restaurant on site open from 7 am to 10 pm daily, for the days when you don't want to cook for yourself. Because we have our own pets, we are unable to accept pet visitors. We have on site secured parking free.